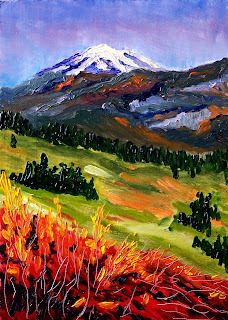 Mount Rainier in Western Washington State is the my subject again. August is the time to visit the mountain if you want to see the wildflowers. It is delightful to venture through the meadows when the blooms are bright and healthy. You can visit the Mount Rainier National Park Page for information about camping and hiking in the area. I grew up with this mountain in my backyard and look forward to visiting again this coming summer. This 5 x 7 painting was completed on hardboard with professional grade oil paints. It is another ugly day in the Pacific Northwest. Rain, wind, and snow are slashing about. When the weather is gray and ugly, I try to imagine a warmer, sunnier time. This 5 x 7 oil painting comes from my imagination. 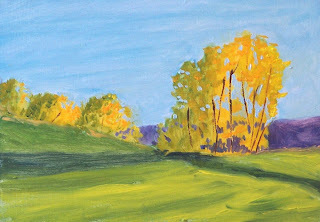 As I painted I was thinking of the comfortable crispness of a sunny fall afternoon. I wanted to use bright colors, so my palette was blessed with four shades of yellow, cadmium orange, and two reds. 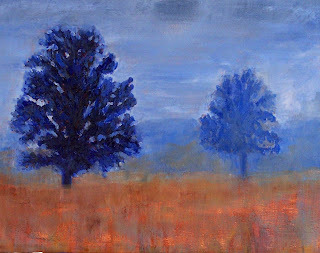 The one blue in the bunch helped to mix the purple of the distant mountains and the bark and shadows of the trees. I hope this little painting will cheer your day as it did mine. Painting this little 5 x 7 oil painting was a delight. The colors cheered me up as I looked out the window at the cold snow of January. This is Mount Rainier in Washington State. Anyone who has visited Seattle on a sunny day has probably seen it from a distance. It is one of several dormant volcanoes that dot the Cascade Range. 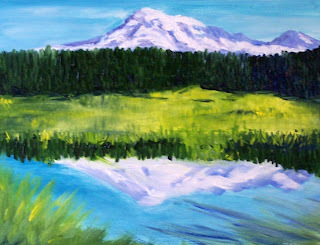 Mount Rainier National Park is open year around, but only in the summer can you see the green grass that surrounds Mirror Lake and its mountain reflection. This painting is 8 x 10 oil on 1/8 inch gessoed hardboard. The Cape of the Arches is at the northwestern tip of Washington State, just south of the Strait of Juan de Fuca. Most of the time, the weather is damp, cold and foggy. It is a fairly easy hike to reach the coast from the Lake Ozette area and provides amazing views for those who are willing to trek through the damp forests of the Olympic Penninsula. 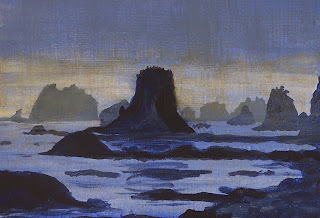 This little 5 x 7 acrylic painting provides a glimpse of the rocks that stand prominentlly guarding the coastline. 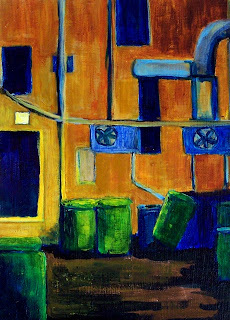 This little 5 x 7 painting is one I did while travelling--a little back alley at sunset. I'm fascinated by the odd shapes of pipes and fans and window on the sides of buildings. The collection of trash cans and the fading light of evening all drew my attention to this scene. The painting was completed on a 1/4-inch gessoed hardboard with artist grade acrylic paints. ACEO is an acronym for Art Card Editions and Originals. 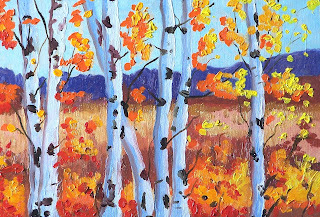 ACEO's are small works of art the size of a baseball card, 2-1/2 x 3 1/2 inches in size. They are affordable and collectible. This little painting is my first attempt at painting these tiny little works. It was a fun and quick little exercise executed on a canvas panel. As soon as the paint is dry on this miniature oil painting inspired by the tulip fields of the Skagit Valley, I will either list it in my Etsy Store or put it up for auction at Ebay. 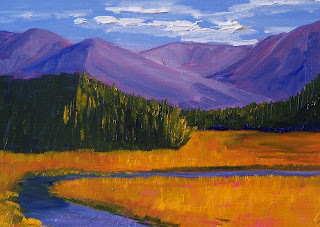 The colors of a brilliant fall afternoon provided the inspiration for this 8 x 10 oil painting. Late afternoon shadows and the sparkle of light on the remaining leaves create a riot of color. This 5 x 7 inch oil painting was inspired by the sparkle of the last light of evening as it glitters off a stand of trees. The brilliant yellow provides a delightful abstraction as it upstages the darkening evening sky and glitters off the edge of a pond. 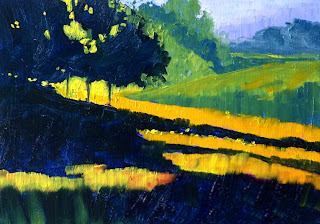 Dark shadows on a summer evening were the inspiration for this little abstract painting. I loved the contrast between the darkness of the shadows and the brilliant light of late evening as it spread across the hillside. 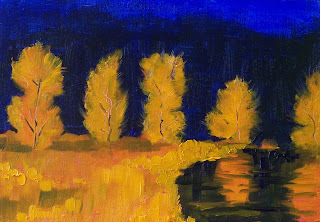 This oil painting is 5 x 7 inches on a hardboard panel. 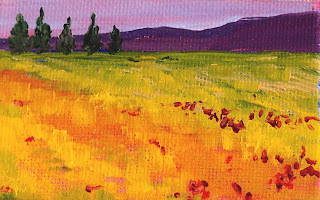 Spring rain on the tulip fields of the Skagit Valley in Washington State provided the inspiration for this littl 5 x 7 abstract oil painting. It is those little spring showers that make the valley such a great place for tulips. This painting has SOLD. This morning I had the pleasure of recreating a scene from Yellowstone National Park. I haven't visited it for a couple of years, but it has some of the most beautiful scenery in the country. Rivers, mountains, and meadows seem to be never ending. I will look forward to visiting again in the future and until then will enjoy the pleasure of painting my memories. This little painting is a 5 x 7 inch oil painting on gessoed hardboard. This painting has SOLD. There is record snowfall in the Cascade Mountains this year. The passes are closed frequently for avalanche control, and the skiiers are having a wonderful time. 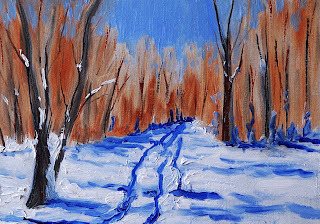 This little 5 x 7 inch oil painting of a snowy road is inspired by the crispness of a winter's day and the brilliance of the sun as it drapes itself across the snow. Today's painting is an 8 x 10 acrylic painting on gessoed hardboard. It was inspired by an early morning fog and the ghostly trees that ermerged from the cloak of mist. It was fun to paint and quite a different experience for me. As most of you know, I don't often paintwith acrylics, but I when I travel, acrylics are a good option. 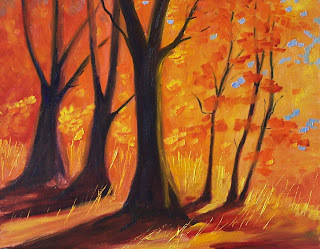 Oil paints can take several weeks to dry. It is a nightmare to try to transport wet oil paintings and avoid damage to the painting and everything else. Although I have a couple of wet canvas carriers which are pretty nifty, transporting an acrylic painting is so much easier. The paint dries quickly and can be packed up in just a few minutes. Oil paint is still my preferred medium, but an acrylic deviation once in a while is fine with me. 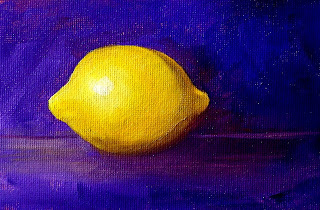 After I finished painting the kissing lemons of Saturday, this little guy showed up for his portrait. 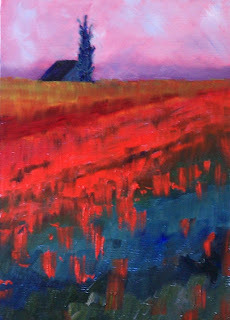 The results are this 4 x 6 oil painting on a canvas panel. It is for sale this month in my Etsy Shop for $24.00 plus $6.50 shipping to US addresses. It would make a wonderful addition to a little collection of small format paintings and can brighten up your kitchen or some other small area of your home. The painting easily fits into a standard frame. Colors may vary slightly due to differences in monitor callibration. Click here to purchase. 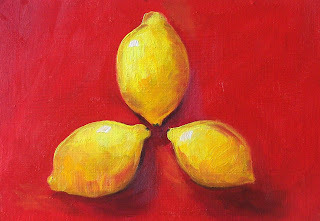 This morning these three little lemons followed me home from the grocery store. They posed very politely and shared affectionate little kisses while I captured their portraits with oil paint on a 5 x 7 inch hardboard. 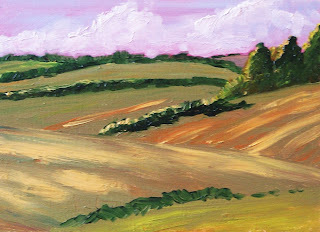 This little 5 x 7 oil painting on gessoed hardboard was inspired by the freshly plowed fields of Eastern Washington. Travel across the state from west to east can provide many glimpses of similar landscapes.